Happy Monday! I hope you had a chance to enjoy the weekend staying warm and enjoying holiday festivities. It was a food-filled weekend for us, spent with our closest friends and family for our annual holiday gathering. I also managed to squeeze in a Holiday Cookie Swap that I attended! Speaking of cookies, we're now on Cookie Day 8 of our holiday countdown. This time, we're making it easy... really easy. Who says you have to make cookies from scratch for the holidays? I know I rarely have time to put makeup on, much less make cookies from scratch at any given moment. In fact, I love the times when I can enjoy the convenience of a mix so I can focus more on the people around me. That said, today's cookie highlights the wonderful world of Krusteaz cookie mixes. These Lemon Macadamia Nut Cookies sound a little fancy but are a cinch to make. With only 5 ingredients, these are quick and fun to make with family and friends. The bright lemon flavor has a subtle hint of vanilla in a buttery cookie that has bits of macadamia nuts throughout. Fancy? Maybe. Fun? Absolutely. As I watch my son grow, I find myself wanting more time with him doing projects together as a family. One way we get that quality time in is by preparing a meal or tackling a recipe in the kitchen. Some ground rules - safety first in the kitchen, no stressing out if things aren't "perfect', and above all, have fun and live in the moment. 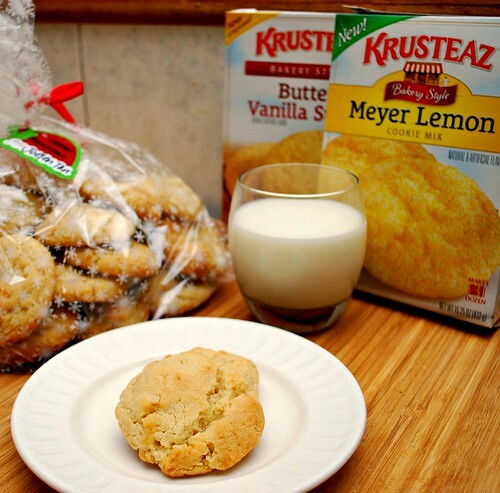 Using Krusteaz cookie mixes eliminates the stress of gathering so many ingredients together and measuring them out. It's also such a time saver! And best of all, my son feels confident in the kitchen baking with the mixes because the directions are just that easy (for a 6 year old!) So rather than get wrapped up in all the stress of holiday perfection, take a moment and just live a little. Make life easier for yourself and have fun in the kitchen. These cookies take two Krusteaz mixes and the addition of macadamia nuts to make a cookie that's all our own. The kids will love making them, the adults will love the fun it provides and everyone will have some delicious memories! Preheat oven to 350 degrees. (If using an insulated baking sheet, set oven to 375 degrees.) Line a baking sheet with parchment paper. In a large bowl, combine cookie mixes, eggs, softened butter and macadamia nuts until dough forms, hand kneading if necessary. Scoop dough accordingly to desired cookie size and place 2 inches apart onto ungreased, parchment paper lined baking sheet. Bake as directed or until light golden brown around edges. Cool 5 minutes and remove from pan. store cooled cookies in an airtight container.